Enjoy the Upper Rogue's most beautiful outdoor venues - voted as one of the top places to say "I do" from the Medford Tribune, or simply celebrate family and school reunions, birthday celebrations and memorial / celebration of life services. Personalized service for each and every event, including a complementary overnight in cabin #2 (see VRBO.com, #383249 for our reviews) for the night of your event, providing you with privacy and relaxing accommodations onsite. Perfect for all types of celebrations from May through the first of October - an outdoor venue only. 50% required at time of booking. Cancellation up to 120 days at no charge, 25% cancellation fee of deposit up to 90 days. No refund of deposit within 90 days. Full balance due 30 days prior to event. Exceeded expectations.... all of them! 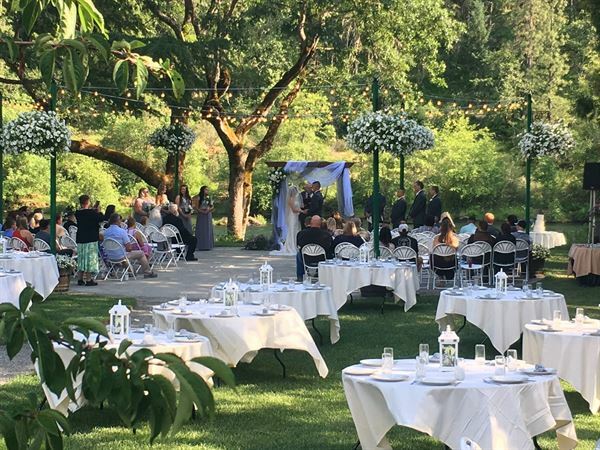 Booked this venue site unseen and it not only is it a remarkable setting on the Rogue River, the owners go above and beyond to make sure that things are handled professionally and beautifully. HIGHLY RECOMMEND. What are you looking for in a venue? - stunning location - experienced hosts - flexibility - extras - bed and breakfast when available - full service bridal salon - recommendations for vendors - table, chairs, ice on site Lee and Anne at Rogue River Lodge provide all of this... like an amazing wedding sundae with a cherry on top. We chose RRL almost solely on the location. Being on the Rogue River was one of the most important "wants" on our list. When we went to visit the venue in May, we thought Lee was nice. The price was right. We booked our date. Fast forward through the next few months.. as a working mother planning my second wedding, I had a different sort of energy and attention to wedding planning. Anne asked all the right questions at the right times, causing me to think through details that weren't even on my radar (I didn't use a wedding planning checklist, book, or magazine, and somehow we managed to get married anyway!). Anne is this amazing combination of helpful, respectful, thoughtful and accommodating. Lee is pretty awesome too, but Anne is the obvious star in the wedding department, while Lee is the super friendly, efficient, support cast. His hard work around the property is obvious. I really can't say enough good things about the RRL or Anne and Lee. I think the best compliment I can give them is that, during the wedding and reception, we didn't even know they were there but they WERE. Everywhere. Making sure everything went just as it should. The venue was magic, especially after the sun went down. As the night wrapped up, we retired to the sweetest little cabin where we slept well and enjoyed a fantastic breakfast the next day. We hope to celebrate our anniversaries at the RRL. Special Features: Private and park-like setting with full indoor restroom facilities, wet bar with up to 1,000 pounds of ice, bridal salon and more...Venue fee includes all rental, set up and breakdown of tables and chairs, as well as tablecloths, and bridal salon.